Plivo Framework is an Open source framework which helps to develop voice based applications including Interactive Voice Response(IVR) systems, Voicemails, Ring Groups, Customer care agent queues etc. without worrying much on the underlying technology or infrastructure. Plivo integrates well with FreeSwitch, an open source implementation of PBX/SoftSwitch. The APIs are well documented, any developer with basic knowledge on telephony applications can develop nice interactive applications within minutes. 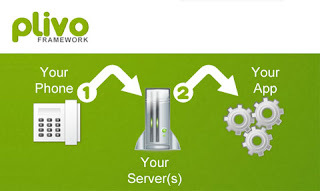 There are two ways to setup multiple applications with Plivo. One way is to install multiple instances of Plivo running on different ports and create different dial-plans in FreeSwitch to forward calls to these instances. Each instance will have its own DEFAULT_ANSWER_URL which will have the logic of your application. Second option is writing the logic to route the calls within a master application, i.e., based on the inbound call decide which child application gets the control. Here you will have only a single DEFAULT_ANSWER_URL, the url of the master application. Plivo is a wonderful framework using which you can any kind of telephony applications. Feel free to contact us @ info[at]texient[dot]com for any help or support in implementing custom applications with Plivo Framework.